We had Max's 4th birthday party at Round Table Pizza in Novato. It's a great place for a party - there's a large indoor play structure that the kids can run around on. For the cost of a couple of pizzas everything's taken care of - no clean up or dishes for Mom. Sweet! Since the theme of the place is King Arthur - I decided a castle cake was in order. I stacked two 8" squares for the main part of the cake, and baked batter in two Progresso soup cans for the turrets. (Is that what they're called? Turrets?) The towers are ice cream cones covered in blue buttercream. For the doors, windows and bricks around the top, I used Dark Chocolate Dough. I love this stuff - it's tasty (like a really good Tootsie roll) super easy to roll out and work with, and freezes like a dream. I've used it to make all kinds of decorations - including bows for a present cake. I achieved the brick effect using a #47 Basketweave Tip on the plain side (as opposed to the serrated side you usually see in basketweaving) piping out 1/2" bricks and alternating the rows. The day before the party I was at the park with the boy thinking about finishing the cake later in the afternoon - then I spied a toy castle in the sandbox. It had a drawbridge. Drawbridge! My cake needed a drawbridge! 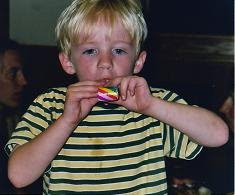 Max had a Bob the Builder Play-Doh set that included a mold to make a 3"-ish rectangle of "wood." Perfect! I used that to mold a drawbridge that not only was the just the right size, but also had a faux bois pattern. 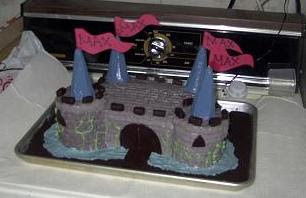 Of course, there's no point in a drawbridge without a moat, so I swirled one around the castle in blue buttercream. The rest of the baking sheet was filled in with crushed chocolate graham cracker "dirt." Remove the dough from the bowl and kneed it a few times. You can mold it into shapes and flowers as is, or roll it out to cut into shapes. To roll it, pat the dough into a flat disk and roll it out between two sheets of waxed paper. Pull off the top sheet of waxed paper. If it is too sticky to pull off cleanly - stick it in the fridge for a few minutes. Cut out shapes with a sharp knife.